Autocar Mondays has been a regular on this site for a number of years now and in that time we’ve seen plenty of trucks roll through that have been lost the ages. 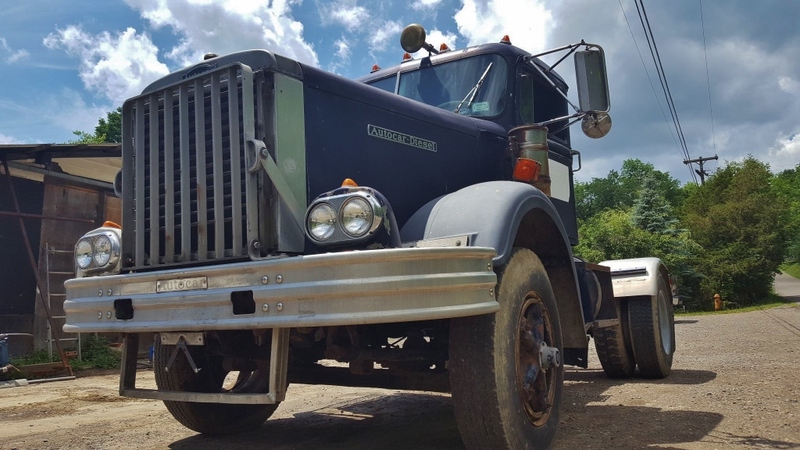 Thankfully this 1965 A75T escaped that fate and is now back in the hands of the family that bought this truck new over 50 years ago. Ray Arnold purchased this truck new from Autocar in November of 1964 and proudly drove it home from the factory a few months later. As assembled the A75T came with a 855 cubic inch Cummins NHE225 engine, Spicer 8016-5B transmission (aka “married box 4×4”), and a White 134C rear axle with a 4.63:1 ratio. With a 156″ wheelbase riding on 10.00-22 12 ply Goodyear Hi-Miler Nylon rubber mounted to five spoke Daytons it would be normal to expect this truck to punish the scales but looks can be deceiving. 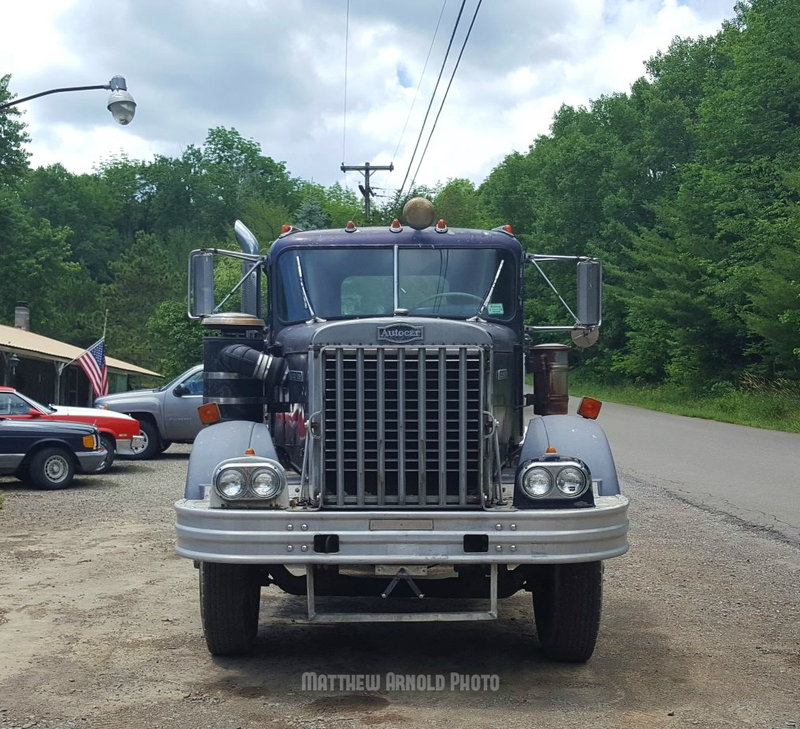 Thanks to an all aluminum cab, hood, frame, crossmembers, transmission case and fuel tank this truck weighs in at just 10,500lbs with a ¼ tank of fuel. In addition to the weight savings the aluminum most likely played a large role in saving this truck from the ravages of NYS road salt. Special factory installed options of the time found on this truck include dual bumper mounted headlight pods for low and high beams, in cab compression release, 32 inch passenger seat, and additional cab marker lights. As weight laws changed a tag axle found its way to the back of the frame which allowed this truck to legally haul 24 tons of cargo. Based out of Spencer, NY Ray and the Autocar would spend the summers hauling materials out of various operations in the Geneva and Horseheads, NY area. 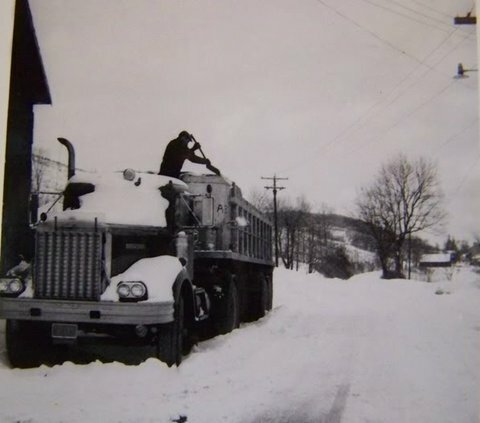 In the winter a propane tank became a permanent fixture in the mirrors as numerous trips were made to large underground storage facilities around the Finger Lakes region. In 1969 a new Autocar joined the fleet and the A75T passed from father to son. 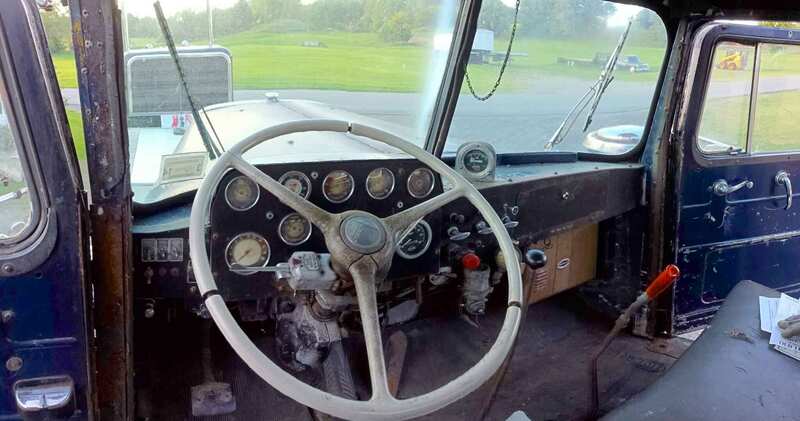 James Arnold would drive the truck for a numbers of years cutting his teeth behind the large white steering wheel (no power steering) and compound transmission. In 1973 Ray sold the truck to P & R Oil under which it would continue to haul loads until the early 1990’s. Following a broken rear spring the truck was parked behind a gas station where it would gather plenty of attention. During this time many purchase offers were made that ultimately failed for one reason or another. Eventually the stars aligned and a new owner was found. 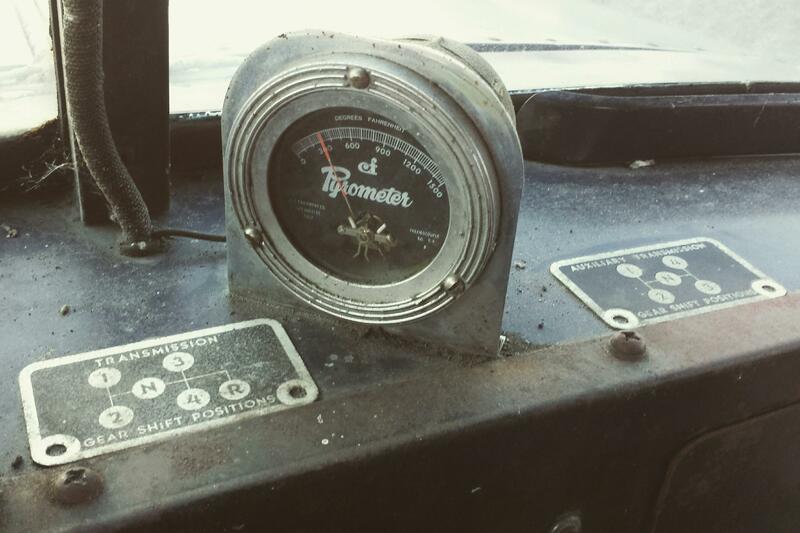 After some repairs the truck began to appear on the show circuit where it came to the attention of the grandson of Ray, Matthew Arnold. Upon inspecting the the truck Matthew’s father suggested not buying it do the worn condition. Thankfully sons rarely listen to their fathers and the truck returned to the Arnold fleet. 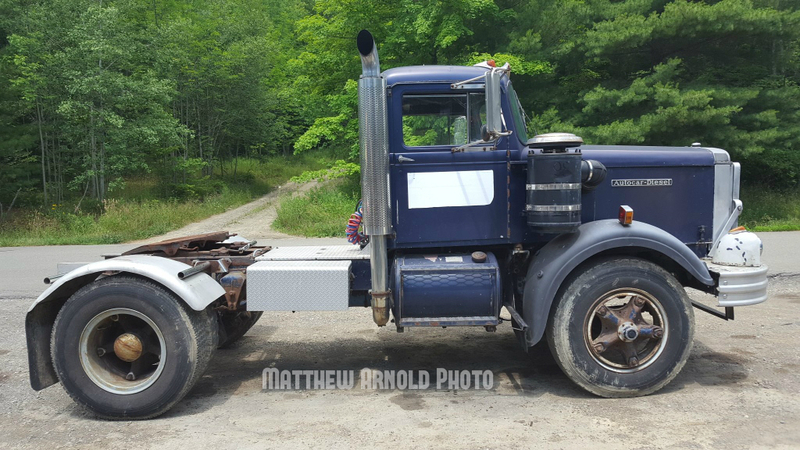 While figuring out how to haul the truck back to his home two hundred or so miles away from it’s current location Matthew learned that his father had been busy replacing fluids, belts and other pieces to get the truck road worthy. If it ain’t broke don’t tow it! You could never tell the two had been separated for the the past 43 years. Not a gear was missed in that compound transmission. With a world that changes so quickly it’s nice to have a tangible connection to the past like the old A75T. 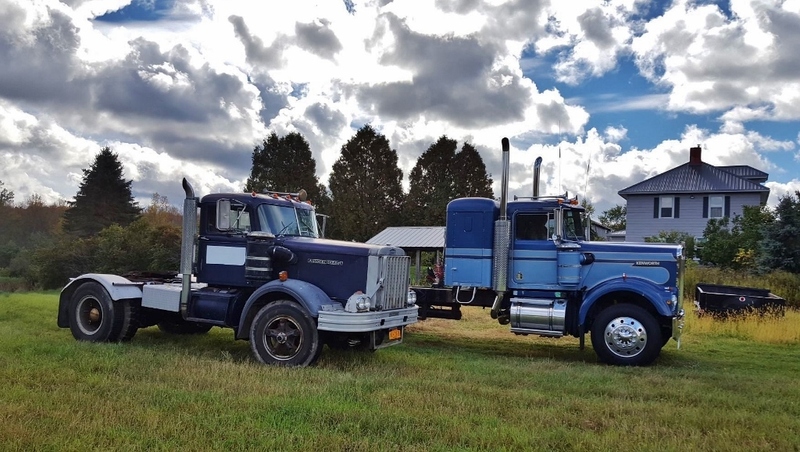 Above we see two generations of Arnolds posing with trucks from the family fleet. They have great tastes if you ask me! A huge thank you to Matthew for providing all the information and photos. 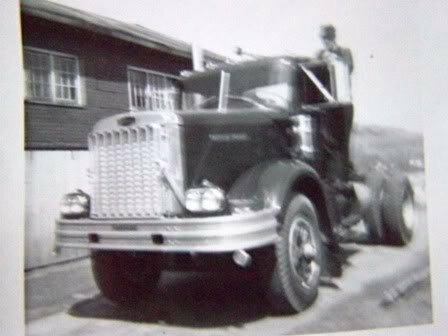 This entry was posted in Autocar Trucks and tagged autocar A75T, P & R Oil. Bookmark the permalink.